The 54th Head of the Charles was a challenging but triumphant return to winner’s circle for the USRowing program on Sunday, with both men’s and women’s boats taking first place in the Championship Eights. Thousands of spectators crowded the banks of the Charles, braving the cold, windy day to watch the most anticipated event of the regatta. Fans were not the only ones complaining about the day’s conditions; severely strong headwinds and whitecaps plagued every boat on the course throughout the entire day. “We knew there were going to be tricky conditions, strong headwinds, we had to dig in and push from the start,” said Dethlefs. The U.S. men chased a strong Yale boat up the course. Yale lead through the first three checkpoints at the Riverside, Weld and Cambridge boat houses. Both boats’ coxswains executed nearly perfect turns into the Eliot Bridge, commonly regarded as the trickiest point in the course. In the final stretch of the race, however, the Yale boat fell behind, allowing USRowing, who had since overtaken the first seed Cal squad and bow three DRV Dortmund boat, to cross the finish line at 14:49, nearly three seconds faster than Yale’s final time, 14:52. Brown finished in third at 15:07.230. Following their gold medal performance at the World Rowing Championships in September, the women’s boat battled through tough conditions on the Charles, posting a time of 16:41, nearly 17 seconds better than second-place Stanford. 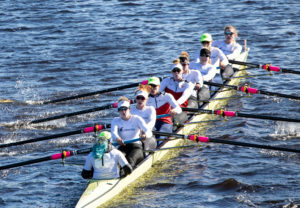 Like every boat on the river today, the winners had to contend with winds that sometimes gusted to 25 miles per hour. Guregian said that Sunday’s race was one of the most difficult races she’s been in. Mueller, who also rowed the Women’s Championship Singles on Saturday said that there wasn’t any point during the race in which they were confident in winning.